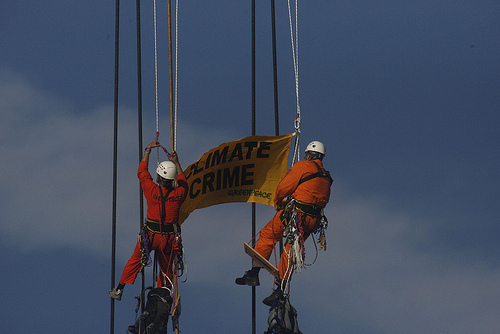 Filipino Greenpeace activist Joel has spent more than 9 hours on top of a crane in the port of a massive pulp facility in Riau. Earlier, his team, along with 10 other activists shut down the entire export facility of the mill owned by APP and parent company Sinar Mas, for seven hours. 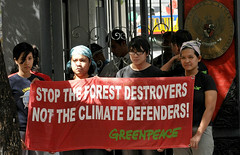 The climate can’t wait, the remaining Indonesian forest can’t wait, and today Greenpeace sent a strong message to world leaders by blocking the Asia Pulp & Paper mill in the heart of the Indonesian forest. This mill is a massive greenhouse gas emitting facility – it is so big that it has its very own coal-fired plant to fuel it’s operations! A few days ago, Swiss Forest Campaigner Asti described her first impressions of the camp. Since arriving she has been busy helping the local community finish a dam that will help preserve the precious peatland and help save the climate. Click here to take action too! There is a big buzz in the Climate Defenders Camp this afternoon. With at least 400 local visitors, including loads of children, and plenty of laughing and singing – it’s open house again. Krisna Mukti, a famous indonesian singer and actor, is just one of the attractions. Youngsters of Teluk Meranti are having a Bantun contest – which is a very nice Malai Tribe tradition to form your everyday life into poems. I know I miss a lot not being able to understand it – todays Bantun poems are all about the forests. Public outreach in the camp is both amazing and motivating. We got into the Climate Defenders Camp late Friday night, the yellow Greenpeace banner emerging out of the night as our boat crossed the river from Teluk Banjai. I got to Jakarta over a week ago, and was beginning to wonder if I would ever see the camp, after the police harassment and deportations of last week. But I was finally here. There wasn’t time for much more than a round of introductions, some dinner and then sleep. After what she describes as two very emotional and intense weeks at the Climate Defenders Camp in Sumatra, Corinna Hölzel, Forest Campaigner from Germany has now left Indonesia. Corinna had intended to stay in the camp much longer but after our successful actions against climate criminals APRIL, circumstances have changed and tight restrictions have been placed on foreigners travel within Riau Province. I belong to the group of people who at least had a chance to stay in the Climate Defenders Camp for some days, but some of my colleagues who arrived later than me haven’t had the opportunity to make this important experience at all. The struggle for zero-deforestation has spilled beyond Indonesia as Indonesian authorities have ramped up intimidation tactics this week against Greenpeace activists who are trying to prevent forest and climate destruction in the heart of the Indonesian rainforest, based at our Climate Defenders Camp on the Kampar Peninsula, Sumatra. The Riau police have detained, interrogated and deported many of our activists as well as an Indian and an Italian journalist.